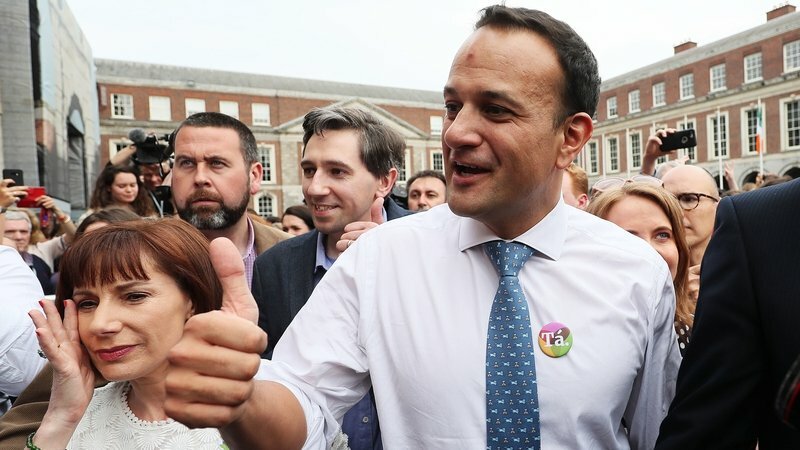 When Taoiseach Leo Varadkar arrived at Dublin Castle on Saturday afternoon, flanked by Minister for Health Simon Harris, the count was almost finished. Ireland had voted to relax its abortion laws, making the provision of abortion services lawful in certain cases. 66.4% voted in favour of repealing the 8th amendment of the Irish constitution. A phalanx of photographers with cameras abuzz, jubilant journalists clamouring for a comment, and thankful campaigners of the triumphant Repeal campaign thronged the Taoiseach upon his arrival. He removed his blazer and traversed the courtyard of Dublin Castle dressed in a crisp white, buttoned-up shirt and tie, navy trousers and a Together4Yes ‘Tá’ badge. (‘Tá’ is a loose translation of ‘Yes’.) Business casual for a sunny Saturday afternoon, the dawn of a new Ireland. “A quiet revolution has taken place, a great act of democracy,” Varadkar posted to his Twitter account, accompanied by a photo of the vast numbers that flooded Dublin Castle. The rolled-up sleeves point to two things. Firstly, it portrays a relaxed demeanour, possibly because the referendum comfortably passed. The Irish Times exit poll on Friday night indicated the landslide victory would see a 2 to 1 majority. Moreover, the symbolism of rolling up one’s sleeves is embedded in the notion of hard work and a readiness to work. In the forthcoming months, the Taoiseach must convince the naysaying cabinet members, and he is obliged to unite the House ahead of the new law’s enactment. He echoed this in his decision to wear a buttoned-up shirt and tie; his ensemble possessed an officious air. Minister Harris looked comparatively dowdy in drab tones. His grey blazer, buttoned-down grey-blue shirt, and taupe trousers weren’t the clothes of a man victorious. Sharing moments with relieved men and women, his face contradicted his dour outfit. Hopefully, the overwhelming majority in favour of the legislative change say, Varadkar will begin to work on passing the bill through the Oireachtas in the coming months. Reports say the process will take up to six months. Ireland’s future is currently in Taoiseach Varadkar’s hands. It’s his time to roll up his sleeves and get down to business.